During the construction of the ginormous pants for my Nausicaa cosplay, I was struck by the fact that the pants would be perfect for a Jasmine cosplay! I knew that I had enough material for it so I just went with it, figuring it would make for a great Halloween costume! 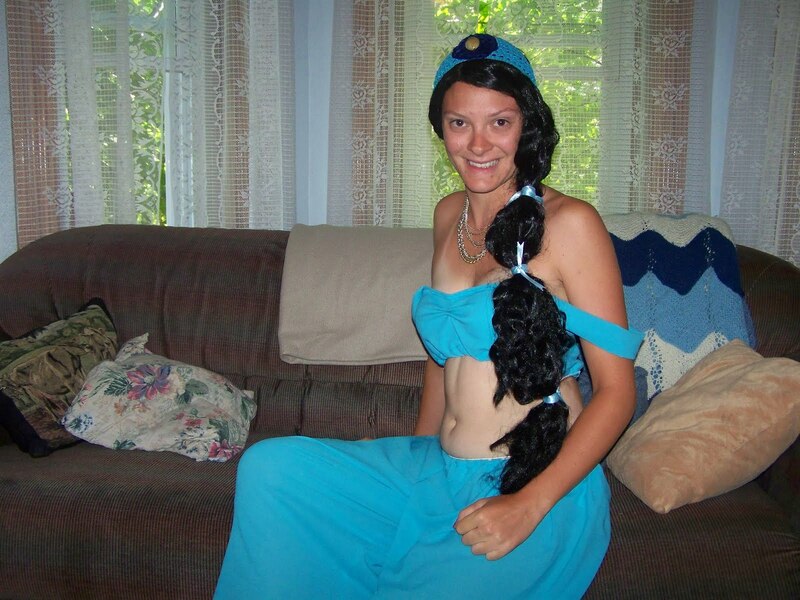 It can also double for a belly dancing costume, which I just took up this past summer. Top - Jasmine's top was completely improvised as I went along. From the extra cut parts from the pants I created a double layered band first. It was too wide for me so I cut it but I accidentally cut it too small to be closed by hook and eye closures. My solution was to have eyelets and a ribbon to tie it shut. I also figured that I would add an elastic to the bottom of the top so there wouldn't be any "accidents". For the shoulder loopies I sewed two layered bands and attached them so they were loose on my shoulders. To make to front of the top pretty I added in some runching in the center. Wig - I bought a long black wig years ago for a Halloween costume that I never actually used. I styled it using thin, old elastics and some spare ribbon. The first time I styled the wig I made the ponytail off the side. I decided I didn't actually like the way it hung so I changed it so the ponytail hung in the back. Headpiece - I have the colours for the jewel mixed up here but I couldn't find a blue stone bead to work with. I sewed the yellow stone onto a circle of blue crushed velvet. For the actual headband part I used an elastic wide band that I never wore that was the perfect colour! 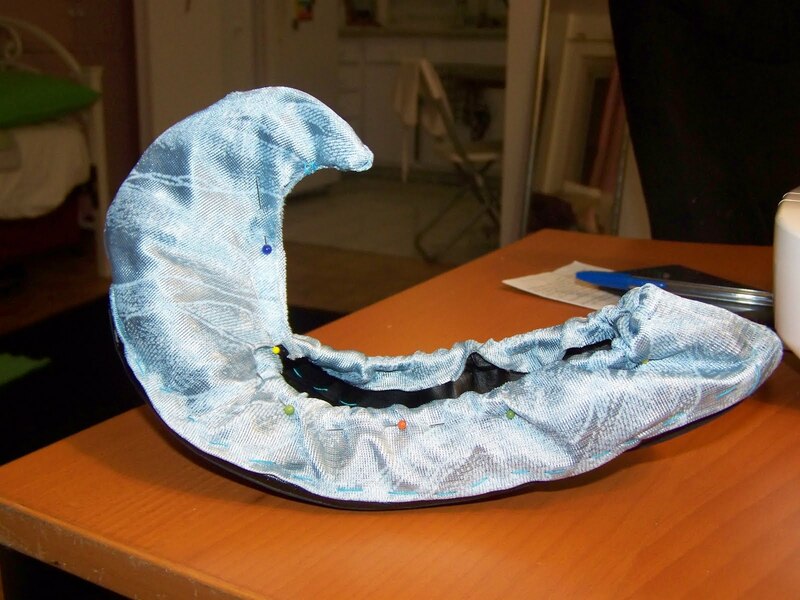 The velvet circle and stone were sewed onto the headpiece. Jewelry - I bought the necklace at Ardenes. I am most likely not going to bother with doing earrings as I don't have pierced ears and my ears are covered by the wig anyways. 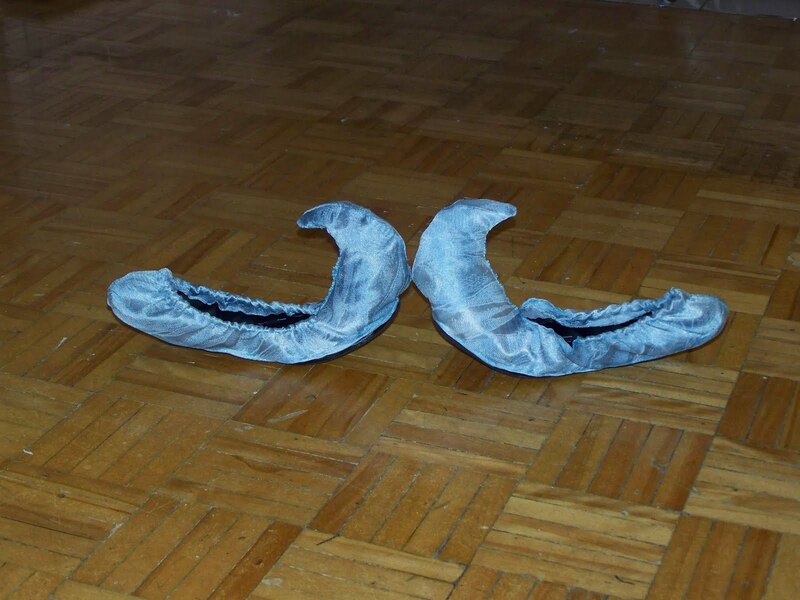 Shoes - I had bought a pair of cheap black slipper shoes from Ardenes figuring that I would either wear them with the costume as they were or I would turn them into blue genie shoes. In the end I was able to turn them into genie shoes! I started out with analyzing the shape of the shoe itself and analyzing the shape of a curly toed shoe. I came up with a rough sketch of what the pattern would look like and decided which measurements I would need to take and how much seam allowance I would give myself. The shoes curled when they were standing on their own so I had to wear one while taking the measurements to get the right numbers for the pattern I was drafting. I drafted the pattern for the shoe on some newspaper and used that to cut out the four pieces I needed. I sewed the two endpoints for both shoes together then fit the fabric over the shoe, pinning it in close to the sole of the shoe. Both fabric pieces fit perfectly on the shoes which was awesome as that way I didn't have to do the whole thing over again! Sewing the material to the shoe was the hardest part. The shoe material was quite thick and so I couldn't put the pins in properly. The pins were all pointing in towards the shoe which meant that I had to be very careful when sewing or else I would get poked. This was the first time I ever used a thimble and by the end of the first shoe I had developed a method of sewing (as well as many wounds from the mistakes I made). The second shoe went by so much faster and with a lot less pricks from the pins. I stuffed the toe of the shoe with scrap material until the toe stood up with enough stiffness. For the first shoe I sewed up the front part of the curled toe first then sewed the top part of the fabric to the shoe. This was a mistake because then I didn't have enough fabric to be sewn all the way around the top of the shoe. There is a little triangular gap were the stuffing can be seen and the over layer isn't attached to the shoe. I learned from my mistake however and the second shoe turned out to be perfect! I waterproofed them with a special spray and let them dry to finish. Next time I attempt to sew shoes I shall get some heavy duty needles and pins. I don't think the ones I used will ever recover! Belt (Detachable waistband) - I used the same material for the belt as I had for the shoes. 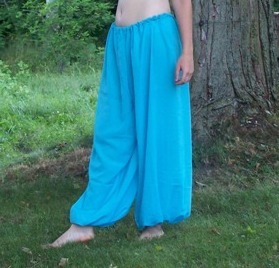 I made it detachable so that the pants wouldn't just be Jasmine pants. I cut out a pattern I drafted on some newspaper. I also cut out the same pattern out of fusible interfacing. I fused the interfacing to the back of the belt and then sewed along the edges of the belt, tucking in the fabric. I hand sewed two hooks and eyes for the fastening. 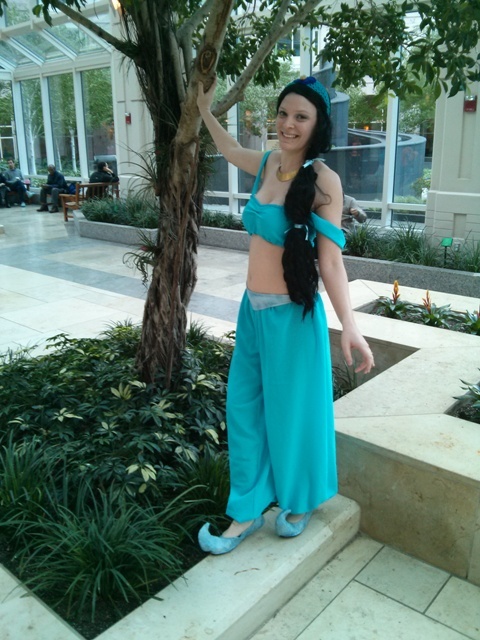 Jasmine was so much fun to wear! It was a great Halloween costume, everyone recognized me and I wasn't dying of the heat! 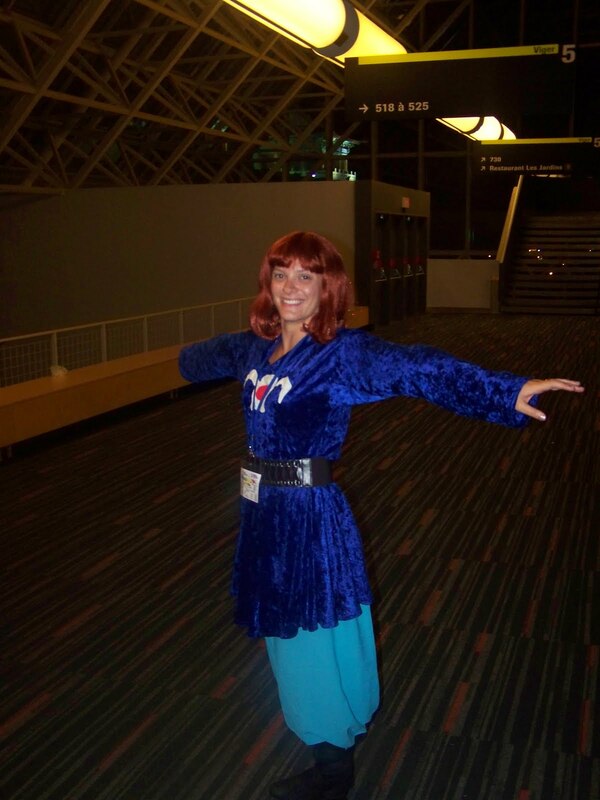 When I wore it to Anime Boston I got so many people asking for my photo. My favourite part of wearing this costume was when little girls came up to me and said that I must be a real princess! I saw Nausicaa of the Valley of the Wind only this past year and I fell in love with the film and the character. As I was planning to go to Otakuthon 2012 (which I did and it was awesome despite me being sick! ), I figured that I might as well try a cosplay! I chose Nausicaa because her costume looked relatively easy enough to pull off without having too many crazy things going on. This is my first official cosplay so I hope you guys like it! Pants: The pants were made of a lightweight, almost sheer, turquoise material that had been given to me a couple of years ago as spare fabric for my beginner sewing projects. I got the inspiration to use that fabric for my Nausicaa pants when I was cleaning up my materials box. I didn't have any sort of harem pants pattern at my disposal so I went to my lovely friend the internet and looked it up. I came across this site here: http://www.reddawn.net/costume/drawstri.htm. I followed the directions and once the pieces were put together I discovered that these pants could have easily fit two of me inside them! I also discovered that my pant legs were wayyyy too long for my legs! So I chopped them off at my ankles to shorten them and proceeded to create an elastic waistband (instead of a drawstring). I added elastic ankle bands as well to keep the poofiness of the pants. Those were a pain to sew! There was so much fabric that needed to be gathered into a tiny circle that I only managed to sew half of both on the machine. The rest I hand stitched O_o. 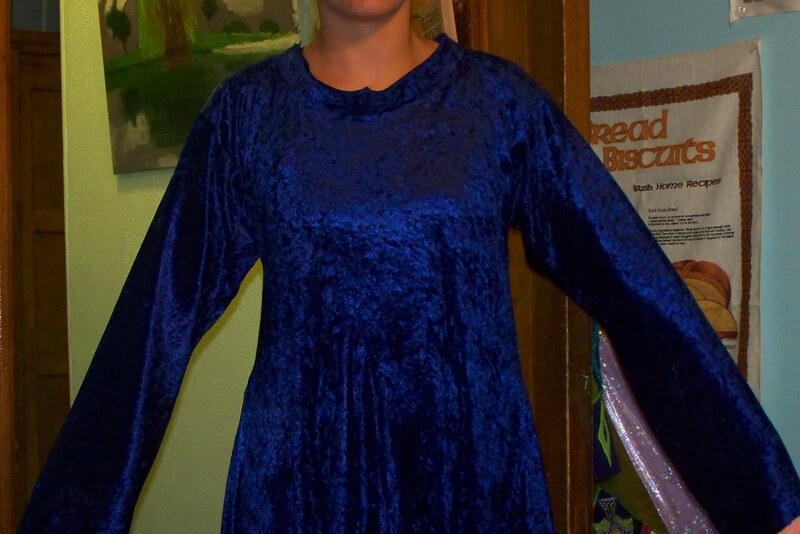 Tunic: The tunic is made of a blue crushed velvet material that drapes really nicely. I chose velvet as my material because I wanted my cosplay to have an authentic feel to it; she is a princess after all, even if she is living in a post apocalyptic era. I found a really good T-tunic pattern on this site here: http://forest.gen.nz/Medieval/articles/Tunics/TUNICS.HTML. This was a good pattern to work with for the basic shape but I did have to tweak it a little and improvise. A lot of the piece that I ended up cutting out were too big so I had to cut them back a bit. It turned out well enough; I had my mum help me with pinning up the hem because my little brother refused to stand still for me and I apparently can't pin things in a straight, horizontal line. The only thing I regret is cutting the neck hole too big. I forgot when I was cutting it that I had to hem it and thus make it bigger. The pattern on the tunic was drawn out by me. I used scrap material for the design. 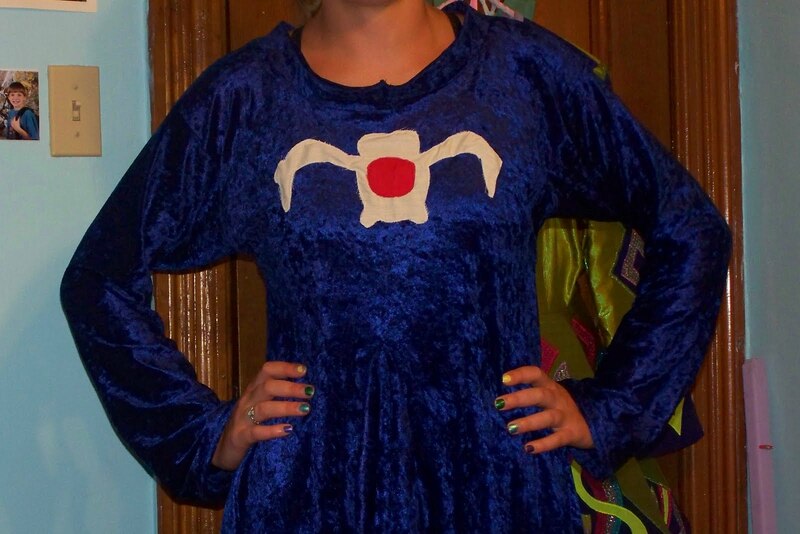 I sewed the red part onto the white part first using a zigzag stitch and then I sewed the whole thing onto the tunic with more zigzag stitching. It was a bit of a rushed job but it does look authentic enough. The collar is my first attempt at a mandarin collar! The collar itself turned out pretty good (in stiffness) except for the fact that it was too small for the neckline :S Basically there is a gap in the neckline at the back which is hidden by the wig I wear. Update (March 2013) - I removed the mandarin collar and I hope to make a new one. Boots: The boots were bought for a cheap price at Sirens a couple of years ago. They are made of faux black suede and have straps that tighten around the legs using a buckle. They are the wrong colour unfortunately. Maybe one day I'll get a pair of brown boots. Wig: I bought it at a Halloween/Party store as I didn't have time to get a nicer one or the money to do so. I ended up only finding a 70's style short red wig which curls at the ends in a really annoying manner. I tried to comb it out with my fingers and that sort of worked. Belt: I plan to actually make the belt one day. I ended up not having the time to do it so I went with a bought one that looked like it would fit in the time. I learned a lot during the making of this. My seams are crooked, my hems are uneven and my collar is messed up. Despite all the flaws I am proud of my work. I really love this character and I have big plans for this cosplay! I want to remake it in it's entirety and make a life sized baby Ohm to model with it! I just think that would be so cool and so iconic. Wish me luck!